Named after the capital of the island of Menorca (or Minorca) where it is made, Mahón is considered the second most popular Spanish cheese, following Manchego. Part of the exceptionally beautiful archipelago called the Balearics Islands, Menorca was first called the “minor” island by the Romans for its small size, compared to neighboring Majorca (or Mallorca) Island. With a size of 268 square miles, Menorca is known for their, dairy cattle farming, specifically for cheese production. Legend dictates that the strong, particular personality of this tranquil and charming isle’s inhabitants is brought by the Menorcan winds. Yet, the wind’s influence over Mahón cheese is strictly fact, as the sea breeze irrigates Menorca’s pasturelands, causing the distinctively acidic, slightly salty cow’s milk used for making Mahón. Mahón’s bold, buttery, nutty, slightly lemony, salty and spicy flavor sharpens during the two-to-three month maturation period in underground caves, with Mediterranean Sea winds further aiding the ripening progression. Cured Mahón continues to cave-age for another six months. Additional aging also intensifies Mahón’s taste and fruity aroma. 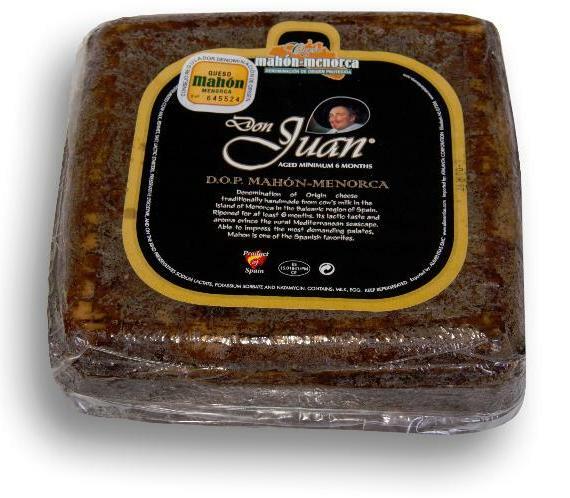 Mahón’s ochre-colored rind results from constant olive oil and paprika burnishing throughout the affinage process and its telltale traditional square shape is a reminder of Mahón’s historical off-island demand, as blocks provided more ease in shipping large quantities to the mainland by boat. From such a small locale comes a significant cheese with grand, revered character - well matched by those who make it. Application: Serve as an appetizer drizzled with Olio Carli olive oil and a sprig of fresh rosemary, Cured Mahón has a firmer texture and spicier flavor also making it a delicious alternative for grating over pasta, potato or rice dishes or shaving into salads and soups. Pairing: Madeira and Tempranillo wines pair well with this wonderful cheese. Steeped in tradition, Olio Carli has been the premier and beloved brand of high-quality Italian olive oil for generations. Made from 100% fresh, ripe olives, Olio Carli olive oil stands in a class above others; while legislation allows for up to 1% acidity in Extra Virgin Olive Oil, Olio Carli only uses up to 0.3%. This dedication to care and quality in their products has amassed legions of followers, from gourmands to home cooks. Carli’s Extra Virgin Olive Oil is truly unique in that it can stand alone in almost any dish. The deep, smooth flavor of the olives is pronounced on fresh vegetables, or drizzled over Mahon. Pair it with the tartness of balsamic vinegar for an outstanding Caprese salad, or make homemade garlic bread brushed with the oil and packed with oven roasted garlic cloves and parmesan cheese.